There’s no cost to download this free resource. 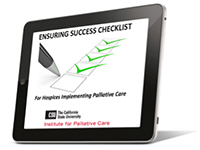 The ENSURING SUCCESS CHECKLIST – For Hospices Implementing Palliative Care is a checklist that you and your team can use to guide your progress. Use this tool to assess your readiness and whether you need to step back, learn more about process, or get more help. And, it has links to resources that can lend a hand, whenever you need them! Can you say YES to these questions? If not, download the checklist! Have we defined our organization’s vision of palliative care services? Have we identified and investigated various community-based palliative care models? Have we determined the extent of palliative care services available in our community? Do we know how to find and evaluate potential partners? Are we clear about the purpose of a robust palliative care measurement strategy? Have we identified the critical elements of our business plan? Do we know how to select communication channels to reach our audiences? Do we understand PQRS, MACRA, and MIPS? Do we have the materials ready for individuals to consider palliative care? Download the checklist tool for all the questions you need to ask! Click Here to Sign Up for Your Free Tool! Learn more about our Community-Based Palliative Care courses here.